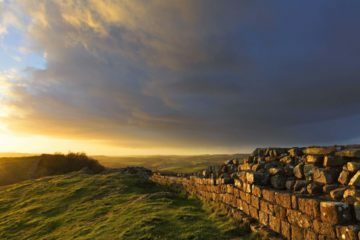 On with my east – west journey we start with the Roman Fort of Chesters where Hadrian’s Wall crosses the wide and shallow River North Tyne. The remains can be found on both sides of the river. Our journey east progresses uphill past a long section of Hadrian’s Wall from Black Carts to Limestone Corner. 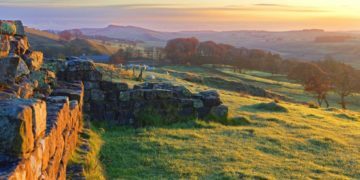 The Hadrian’s Wall Path continues to the ancient Roman Mithraic Temple at Brocolitia and to Sewingshields where it joins the rugged and undulating crags of the Whinsill Fault that define this section of Hadrian’s Wall with its iconic and dramatic scenery. The point where the Trail turns left and downwards is one of the grandest views of Hadrian’s Wall. The undulations of the crags can be seen disappearing westwards into the far distance. From vantage points such as this it is clear to see how the topography has assisted in the effectiveness of Hadrian’s Wall as a border between the Roman Empire and the hostile peoples further to the north. The Roman Wall sweeps downwards towards Housesteads which is a well preserved example of a Roman Fort layout. From here the ups and downs of the crags take over with the next major view point at Hotbank Crags which looks over Crag Lough – the only lake adjacent to the Wall – and Winshield Crags. Hidden in the ups and downs beyond Crag Lough is the much photographed Sycamore Gap with England’s favourite tree. 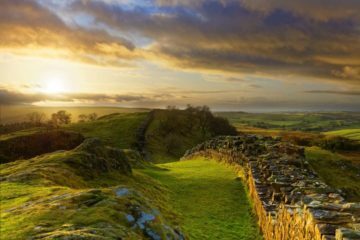 Looking east from Steel Rigg is another iconic view of Hadrian’s Wall. Moving onwards up Winshield Crags is the highest point along the Wall – again with magnificent views to the east. From Winshield Crags it is downhill past Caw Gap to Cawfields and Cawfields Quarry and pool. From here a wander over the Nine Nicks of Thirlwall takes you to the last of the crags at Walltown and eventually to the quarry with its pond. Look out for the Roman Army Museum. The final point of interest in this Middle Section of Hadrian’s Wall is the ruins of Thirlwall Castle. 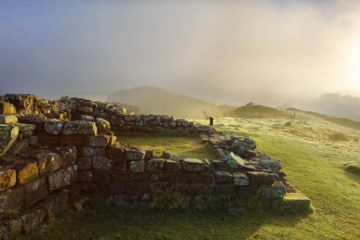 From the turret early on a breezy spring morning low cloud is seen blowing across Hadrian's Wall at Walltown Crags in Northumberland. Looking east from the turret on Walltown Crags at sunrise on a cold late autumn morning. Cawfields Crags and Whinshield Crags can be seen in the distance. 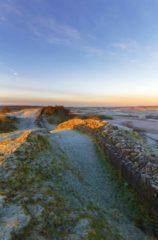 A late winter dawn near the Turret on Hadrian's Wall at Walltown Crags in Northumberland. Sheep and Cattle farming predominates in this part of Northumberland. 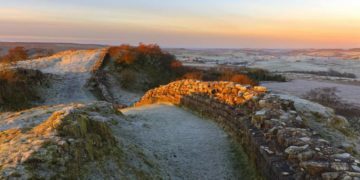 A very frosty late autumn morning on Hadrian's Wall at Walltown Crags in Northumberland as the sun rises above the horizon. Whinshield Crags can be seen in the distance. On the slope below the turret on Walltown Crags on Hadrian's Wall in Northumberland there are a small number of trees. The sheep snoozing in the snow makes a delightful pastoral scene. 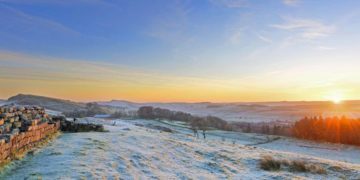 Walltown Crags on Hadrian's Wall in Northumberland on a bright winter morning. 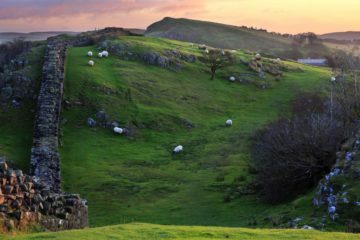 Much of Hadrian's Wall is upland farms and sheep are found in abundance. 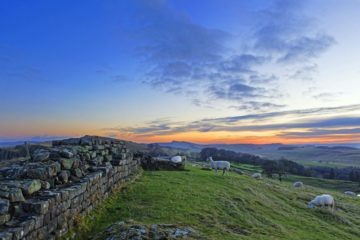 Looking west from the turret on Hadrian's Wall on Walltown Crags in Northumberland on a cold late autumn evening. A blustery shower was imminent. Looking west from the turret on Hadrian's Wall on Walltown Crags in Northumberland on a beautiful, bright, frosty, late autumn morning. 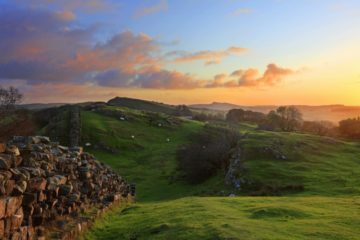 Sunset at Walltown Crags on Hadrian's Wall in Northumberland on a wild, late autumn evening. The strong wind bringing a succession of blustery showers from the north west. 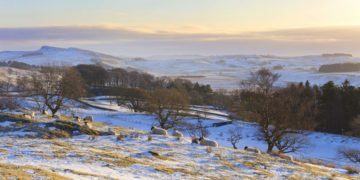 Walltown Crags on Hadrian's Wall in Northumberland on a midwinter late afternoon. 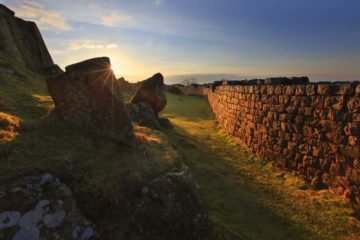 This short section of Hadrian's Wall has always offered a challenge for an interesting and picture.